Carolina Ear Nose & Throat Practice brings technology closer to its patients. Carolina Ear, Nose & Throat/Head and Neck Surgery Center in Hickory became only the third ENT practice in the state to incorporate an in-office CT scanner to its clinical practice. Traditionally performed in a hospital setting, office based CT scanners are the newest trend in medicine to control medical costs, improve patient care and convenience. 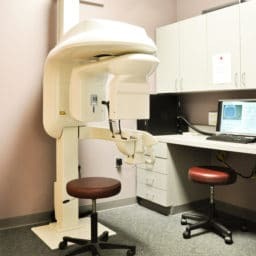 CT scans are used in Ear, Nose & Throat practices for the evaluation of chronic sinusitis, dizziness and chronic ear disease, among other conditions. The scanner utilizes ultra high resolution (0.09 mm) which delivers superior fine bony structure visualization while doing so in a comfortable upright position. The time to take the image is about 15 seconds. The radiation dose is up to 94% lower than standard conventional CT exams used in the hospital setting. The CT scan cost is also typically a fraction of what one might pay out-of-pocket in other settings. Convenient, fast, accurate and less expensive. Point-of-care CT scanning enables us to begin the correct treatment to patients more quickly.